Riad Berta - a traditional and lovely decorated house, a Patio with palm trees, plants and a fountian, a Moroccan salon, nice rooms and a roof terrace also with lots of plants- is located in an alley in the Medina of Marrakech (access by car possible). Around the courtyard are two rooms, the Moroccan salon with chimney and TV as well as the small restaurant. On the first floor are six rooms and a small salon. The courtyard opens to the sky, a movable roof protects against rain and the nocturnal winter cold. On the roof terrace you can relax and enoy sun and light. A rich breakfast - as well as lunch or dinner on request- will be served to you either in the courtyard, the restaurant, the salon or on the roof terrace - wherever you prefer it. Our cook prepares traditional Moroccan dishes using fresh and mostly biologically produced ingredients. As our guest your well-being is most important to us ! 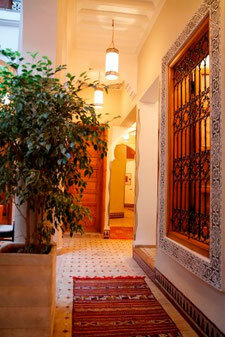 Be welcome to our Riad !